An extraordinary selection of poetry by Kimiko Hahn, Toxic Flora beautifies the ugliness of the scientific life and the elements of being human through poetry. Extending from the common small animals of the world to outer space, Hahn delivers a speckling of her work with both clever brevity and clarity. 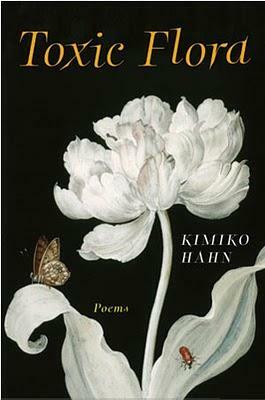 Projecting moments grasped from the New York Times, Hahn elaborates only the slightest amount necessary in her poetry, leaving the reader to ponder and to possibly wonder about the natural world and the human place in it. Daily situations are approached from a poetic and often non-human aspect to bring feelings of the world beyond humanness. Prose poetry escapes definition in Hahn's description of wildlife that possess unknown talents and survival skills humans may understand when reading her poetry. To strike the reader, she sometimes utilizes italics to emphasize scientific horrors—irreversible human impacts. Sometimes humorous, but always thoroughly specific, Hahn's poetry possesses powers of imagination to reality. She expresses her yearnings while demonstrating her angst in asking questions throughout each piece while each piece connects and completes the collection. Her allusions to nature's subjection to pollution and a sullied environment again point out obvious human error. Beyond her connections to nature, Hahn elaborates on the relationships of people to people, specifically father to daughter, lover to lover and mother to daughter. These human aspects help to signify the connections of all living organisms in the collection. Inserting herself into the poetry, Hahn brings relationships to herself. She alludes to her truths, her ways. Colorful and active, the poetry never leaves the side of the human living regardless of the role each human plays. Myths may exist, but Hahn again connects science to myth, deciphering bits of science for the reader.